Red Hat® Ansible® Tower helps you scale IT automation, manage complex deployments and speed productivity. Centralize and control your IT infrastructure with a visual dashboard, role-based access control, job scheduling, integrated notifications and graphical inventory management. And Ansible Tower's REST API and CLI make it easy to embed Ansible Tower into existing tools and processes. Ansible is amazing. It's already allowed us to save at least 10-15 hours per week managing our systems. 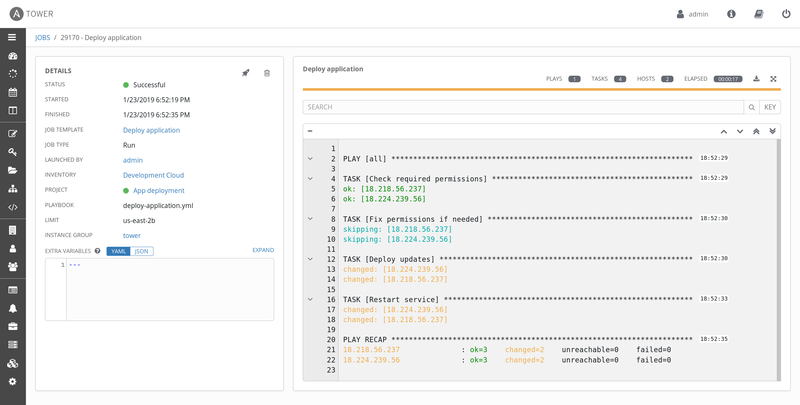 The Ansible Tower dashboard provides a heads-up NOC-style display for everything going on in your Ansible environment. As soon as you log in, you'll see your host and inventory status, all the recent job activity and a snapshot of recent job runs. Adjust your job status settings to graph data from specific job and time ranges. Within Ansible Tower, playbook runs stream by in real time. As Ansible automates across your infrastructure, you’ll see plays and tasks complete, broken down by each machine, and each success or failure, complete with output. 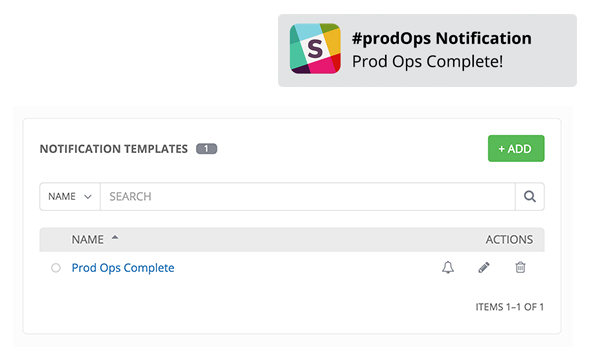 Easily see the status of your automation, and what’s next in the queue. 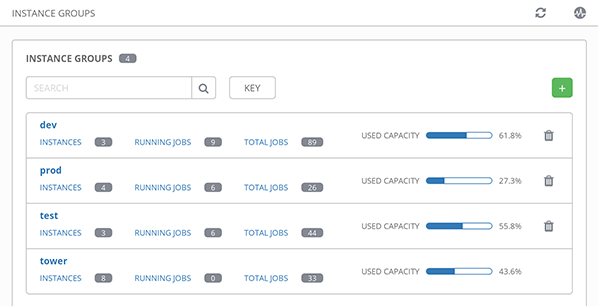 Other types of jobs, such as source control updates or cloud inventory refreshes, appear in the common job view. Know what Ansible Tower is up to at any time. 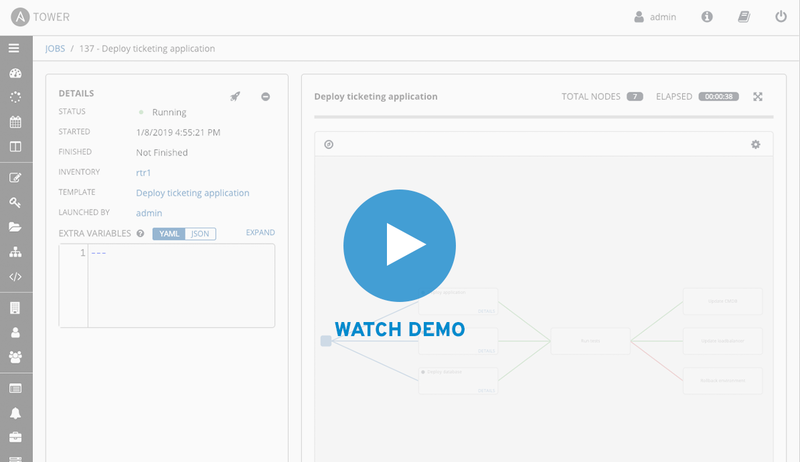 Ansible Tower Workflows allow you to easily model complex processes with Ansible Tower's intuitive workflow editor. Ansible Tower workflows chain any number of playbooks, updates, and other workflows, regardless of whether they use different inventories, run as different users, run at once or utilize different credentials. You can build a provisioning workflow that provisions machines, applies a base system configuration, and deploys an application, all with different playbooks maintained by different teams. You can build a CI/CD testing workflow that builds an application, deploys it to a test environment, runs tests, and automatically promotes the application based on test results. Set up different playbooks to run in case of success or failure of a prior workflow playbook. With Ansible Tower, all automation activity is securely logged. Who ran it, how they customized it, what it did, where it happened - all securely stored and viewable later, or exported through Ansible Tower’s API. Activity streams extend this by showing a complete audit trail of all changes made to Ansible Tower itself - job creation, inventory changes, credential storage, all securely tracked. All audit and log information can be sent to your external logging and analytics provider to perform analysis of automation and event correlation across your entire environment. Connect multiple Ansible Tower nodes into a Ansible Tower cluster. 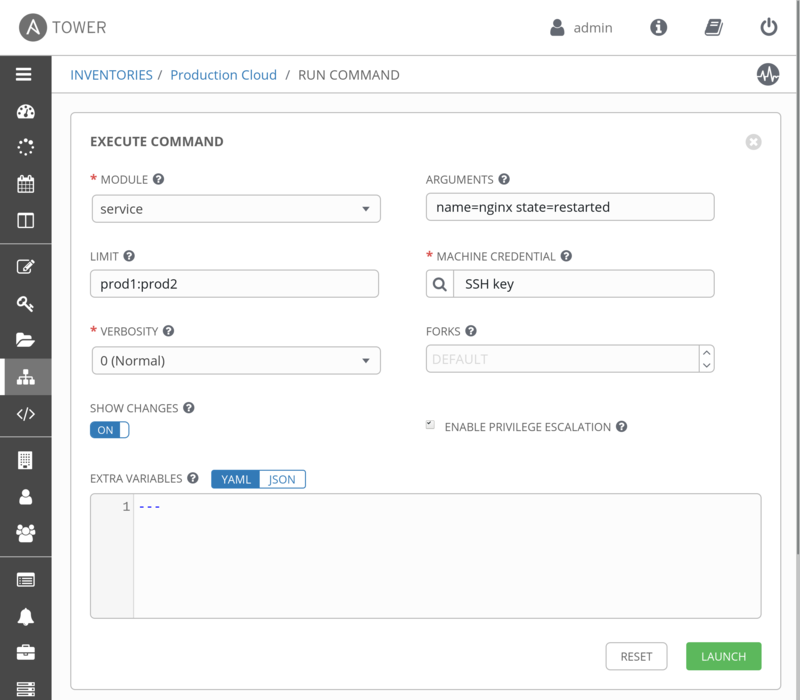 Ansible Tower clusters add redundancy and capacity, allowing you to scale Ansible automation across your enterprise, including with reserved capacity for certain teams and jobs, and remote execution for access across network zones. NEW! Ansible Tower now available as a clusterable container service in Red Hat OpenShift. Stay informed of your automation status via integrated notifications. Notify a person or team when your job succeeds, or escalate when jobs fail. Send notifications across your entire organization at once, or customize on a per-job basis. Connect your notifications to Slack, Hipchat, PagerDuty, SMS, email, and more - or post notifications to a custom webhook to trigger other tools in your infrastructure. Playbook runs, cloud inventory updates, and source control updates can be scheduled inside Ansible Tower - run now, run later, or run forever. Set up occasional tasks like nightly backups, periodic configuration remediation for compliance, or a full continuous delivery pipeline with just a few clicks. Ansible Tower helps you manage your entire infrastructure. 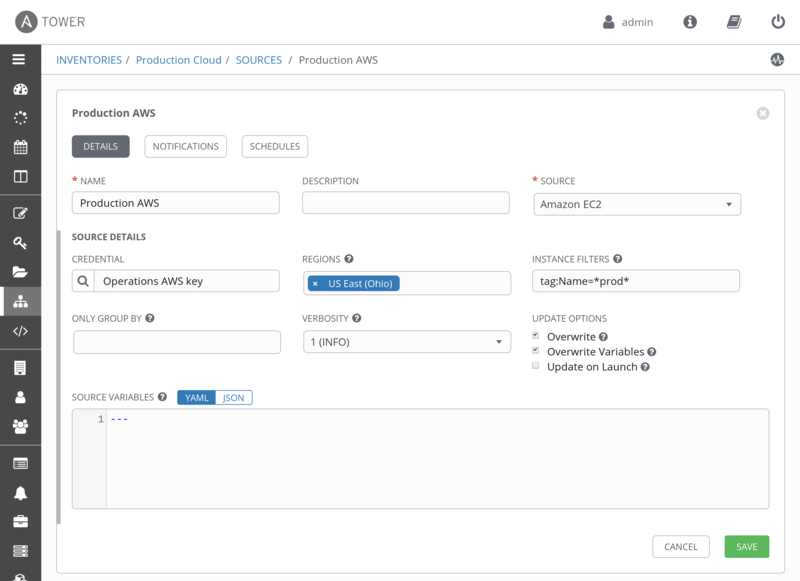 Easily pull your inventory from public cloud providers such as Amazon Web Services, Microsoft Azure, and more, or synchronize from your local OpenStack cloud or VMware environment. 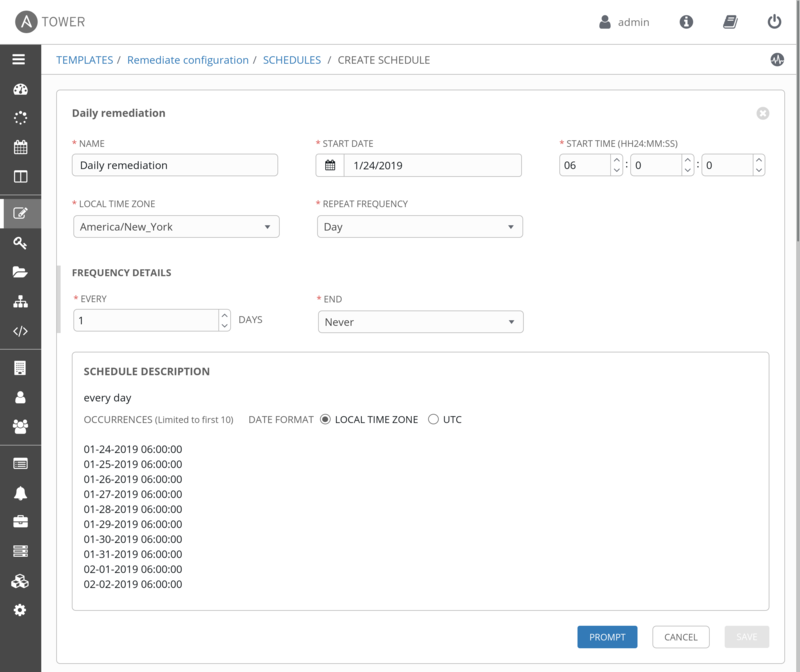 Connect your inventory directly to your Red Hat Satellite or Red Hat CloudForms environment, or your custom CMDB. Ansible Tower can keep your cloud inventory in sync, and Ansible Tower's powerful provisioning callbacks allow nodes to request configuration on demand, enabling autoscaling. 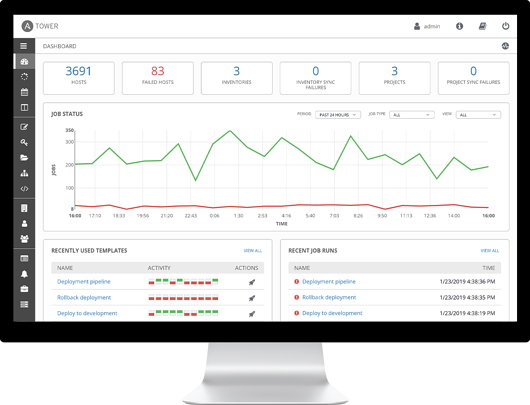 You can also see alerts from Red Hat Insights directly from Ansible Tower, and use Insights-provided Playbook Remediation to fix issues in your infrastructure. Plus, Ansible Tower Smart Inventories allow you to organize and automate hosts across all your providers based on a powerful host fact query engine. Ansible Tower has allowed us to provide better operations and security to our clients. It has also increased our efficiency as a team. Ansible Tower lets you launch playbooks with just a single click. 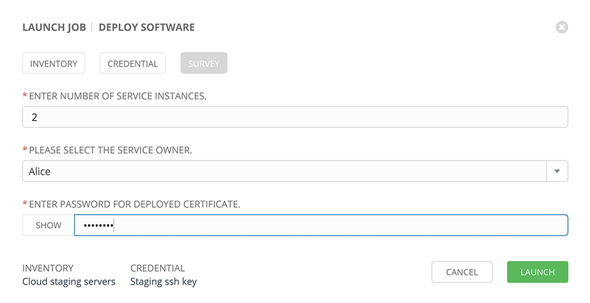 It can prompt you for variables, let you choose from available secure credentials and monitor the resulting deployments. Ansible Tower's simplified portal mode and survey features allow IT administrators to delegate automation job runs to users across the organization - synchronized directly from corporate directories such as LDAP, Active Directory or delegated SAML authentication. With Ansible Tower delegation, developers or QA departments can provision their own dev and test environments. Customer service agents can provision a new demo environment. Or junior admins can run simple jobs - like changing passwords - all at the press of a button. Run simple tasks on any host or group of hosts in your inventory with Ansible Tower's remote command execution. Add users or groups, reset passwords, restart a malfunctioning service or patch a critical security issue, quickly. As always, remote command execution uses Ansible Tower's role-based access control engine and logs every action. Far from being limited to just the user interface, every feature of Ansible Tower is available via Ansible Tower's REST API, providing the ideal API for a systems management infrastructure to build against. 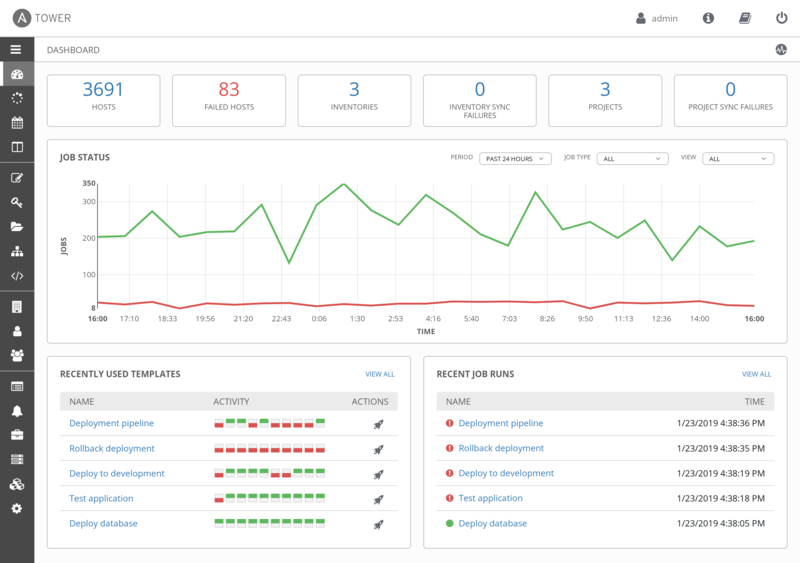 Call Ansible Tower jobs from your build tools, show Ansible Tower information in your custom dashboards and more. 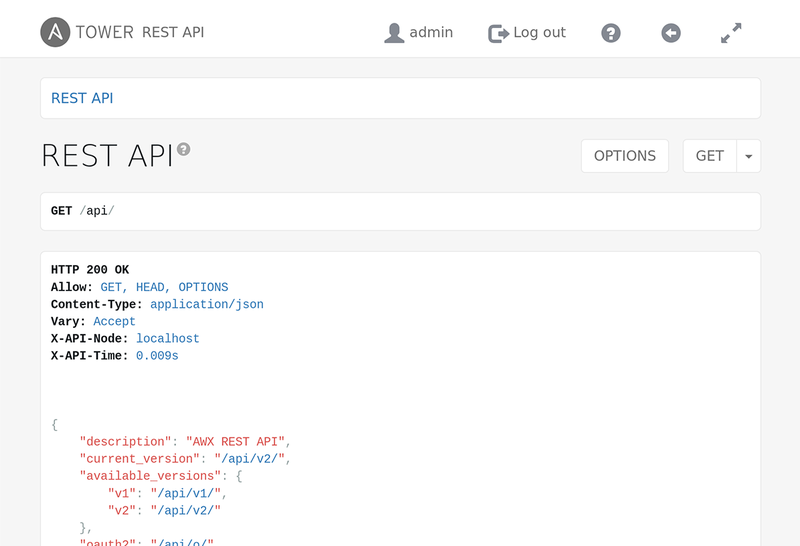 Get API usage information and best practices with built-in documentation. If it's easier for you to wrap a command line interface than write REST code, Ansible Tower's CLI tool is available for launching jobs from CI systems such as Jenkins, or when you need to integrate with other command line tools. NEW! API access tokens make 3rd-party integrations even easier.